VINIFICATION: Temperature-controlled fermentation in rotor tanks and vinification in small oak casks (Nevers, Allier, and California oak) for sixteen months. BOUQUET: Cabernet Sauvignon, Cabernet Franc, and Merlot were introduced to South Tyrol in the second half of the nineteenth century. The warmest slopes above Kurtatsch turned out to be perfectly suited for these French newcomer varieties as early as the first historical growing period. In the immediate vicinity of the Renaissance Freienfeld Manor are to be found the best Cabernet zones of the same name which, like a French clos , are surrounded by stone walls and old farmhouses. The loamy, permeable gravel bed is a multiform little "terroir" that has all the preconditions to enable the Cabernet Sauvignon vines to produce at their peak. 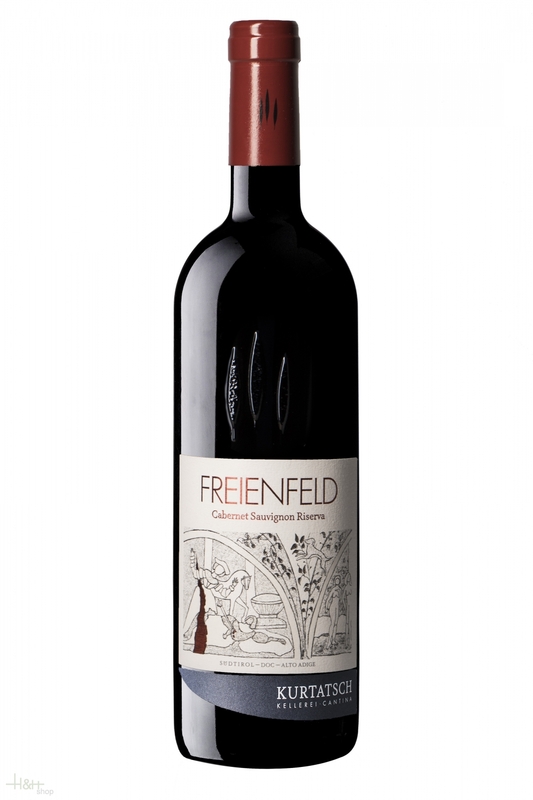 "Freienfeld" Cabernet is a single varietal Cabernet Sauvignon that represents the quintessence of quality winegrowing in Kurtatsch. Only when weather conditions have produced an optimal vintage is a "Freienfeld" produced. The vinification of the new wine takes place in lightly toasted small casks of French oak, which enrich the powerful structure of the wine with velvety roasted characteristics. During aging in the bottle, the dramatic bouquet settles down, becoming reminiscent of a garland of wild potherbs as well as the damp earth in which laurel, rosemary, lavender, and peppermint grow. The considerable richness of fruit (black currants, cherries, and plums) is supported by a lithe framework of tannin that provides spectacular length to the finish. "Falstaff Magazin" has rated the wine "Kellerei Kurtatsch 'Freienfeld' Cabernet Sauvignon, Trentino-Alto Adige, Italy" the vintage 2011 on 24.06.2014 with 88 of 100 points. "Falstaff Magazin" has rated the wine "Kellerei Kurtatsch 'Freienfeld' Cabernet Sauvignon, Trentino-Alto Adige, Italy" the vintage 2010 on 25.06.2013 with 90 of 100 points. "Falstaff Magazin" has rated the wine "Kellerei Kurtatsch 'Freienfeld' Cabernet Sauvignon, Trentino-Alto Adige, Italy" the vintage 2009 on 11.07.2012 with 90 of 100 points. "Falstaff Magazin" has rated the wine "Kellerei Kurtatsch 'Freienfeld' Cabernet Sauvignon, Trentino-Alto Adige, Italy" the vintage 2007 on 08.07.2010 with 90 of 100 points.